“I have had this plant for nearly 30 years and at the time I received it it was a large mature plant. (Several years ago I subdivided it and repotted it.) This plant has only bloomed for me just a handful of times and then it was during July-August. The blooms were half again as long as my Thanksgiving cactus, more of a reddish-orange in color and the individual petals were longer and curled back more giving the blossoms a more "frilly" look. What do I have here? Is it a Christmas Cactus that has a mind of its own re. blooming? I now live in FL and there are no large shade trees I can put this under during spring through fall. I keep it inside with indirect sunlight. I know temp and lighting conditions are not of the type to induce blooming. You have a genuine, no longer on the market Christmas cactus. A couple of years ago someone gave me their 35-year plant (see photos) that is currently blooming. Christmas cactus like to be crowded to bloom so re-potting may have interfered with their blooming cycle. They also prefer sandy soil. Since they are so shallow-rooted, the sand makes it easier for them to grow. Since you are in Florida, their light requirements may have interfered with their blooming cycle. To get them to bloom, they need to be placed in the dark for a few weeks. You can place them in a dark room or cover with a box or bag for at least 12 hours a day for a month. Once tiny buds appear, you can give them light again. Their darkness requirements are similar to Poinsettias, originally from Mexico, that also require being in the dark for a few weeks in fall so their bracts turn red by Christmas. So if you want them to bloom around Christmas, put them in the dark in September or October and you should have flowers by December. These plants originated from the Espirito Santo area of Brazil. The Thanksgiving cactus has taken over the retail market as a "Christmas cactus" since they have been bred to have a variety of colors and the original "Christmas cactus" is no longer sold. Thanksgiving cactus, by the way, has little spikes on the end of their pads, like little horns. The original Christmas cactus pads are long and smooth. Let me know if this works for you, it has kept my variety of both Christmas, Thanksgiving and Easter cacti continuously blooming! 1. Walk more. We are too reliant on fossil fuels including coal, oil and gas. By planning to walk more, we can reduce using gas for our cars and improve our health. Just 15 minutes outside will get us all the minimum daily requirement of vitamin D and also kick off the endorphins that makes us all feel better. 2. Consolidate car trips. Again designed to reduce our use of gas, better plan trips so that you’re not using as much gas. Besides reducing the fossil fuel load, you will save money. 3. Ride a bike. If you have a community that has bike lanes and safe drivers, dust off that bike and start riding it. 4. If you are buying a car, look at hybrids and electric cars. 5. Save water. If you keep your faucet running when you brush your teeth, turn the faucet off until you need water again. Use a dishwasher, it uses less water than hand washing; set it on the economy setting. Plant plants that don’t need constant watering such as natives to your area. 6. Install rain barrels on your gutter system. Rain water is better for plants and will help cut down on your water bill. 7. If installing and replacing a heating and cooling system, pick a heat pump. 8. When replacing your water heater, install a solar-powered one. 9. Re-think your diet. Reduce eating red meat once a week, then slowly cut back a second day. Less red meat consumption will reduce methane gas production. 10. Buy less food. Nationally, US residents throw away 40% of the food they buy so be more deliberate with food shopping. Freeze what you can’t eat, plan for leftovers and make sure to compost what you don’t want to eat. Composting helps keep soil healthy and soil keeps our plants, and us, healthy. 11. Buy local produce. Farmer’s markets, grocery stores and local farmers all offer locally-grown produce that is less fertilizer and pesticide-intensive to grow. And it tastes better, too. 12. Choose items made from renewable and easily sustainable bamboo. 13. Dust off your grandmother’s china and start using real dinnerware and utensils, no more plastic. 14. Carry a set of reusable bags to carry groceries and other items instead of store plastic bags. 15. When voting, select candidates who recognize the threat and commit to working together to change our country’s direction. 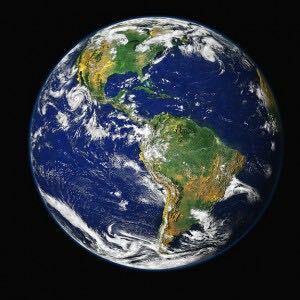 What else can you think of doing to reduce your carbon foot print? Do You Want to Keep Ash Trees with Borers? “Your area is known to have a building population of emerald ash borer (EAB). By keeping the trees on your property, you aren't spreading this insect. If your trees were infested prior to being cut, then it's likely that some of the EAB larvae that are currently in the trees will finish their lifecycle this spring and chew out as adult beetles in May. The beetles won't re-infest your ash wood, however, so your ash wood won't continue to be a source of food for EAB. You may notice lots of other native borers that attack the wood, since many of our native species help with decomposing dead trees on the forest floor. When I use ash in my garden and flower beds, I usually get about 2 years out of a large chunk before the native borers break it down to the point where it isn't useful to me. You might extend the life of the wood by applying a product to prevent borers, like BoraCare or TimBor, or even sealing the wood with an outdoor wood sealer. Insecticides are out of the question for me since I keep bees so I am resolved that I will lose the rest of my ash trees and am already planning what to plant in their stead. It's getting late in the season to plant mums but as long as the ground is not frozen you should be able to still get them in. Make sure they, and the soil you are planting them in, is well-watered before you add the plants. Once in, add mulch to keep their soil temperature from fluctuating. A nice blanket of wet dried leaves will work if you don't have anything else handy. The key to pulling mums through winter is to keep them regularly watered. 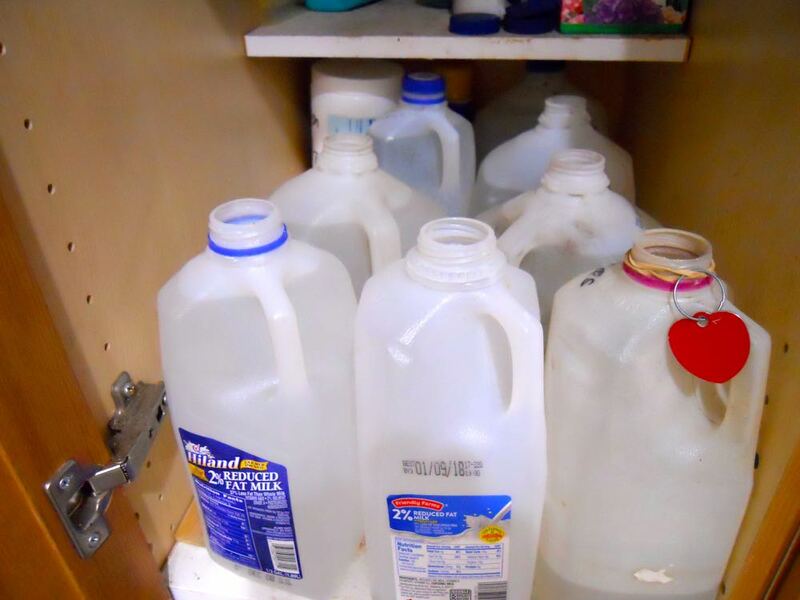 I take 2 old milk jugs full of water out to my garden twice a month and water my mums if we haven't had rain and/snow. You are basically keeping the roots hydrated so they can establish themselves. Don't cut off the dry flowers, those will protect the new growth that will start at the bottom in the center. If you want to add more mums, spring is a good time to get starts, that way the plant has all growing season to establish itself and grow. To maximize blooms, pinch off the starts every week until July 4, that will keep their shape rounded and bushy. If you have any other questions, please let me know. Good luck! When Is It Too Late to Plant in Fall? I would if I had not done this a few times before. The question of when to stop planting has to do with how cold the soil is, not the first hard frost. In USDA Hardiness zone 5b, although we may have our first killing frost around Halloween, which kills off the top of the plant, the critical part of the plant that needs to get established is the roots. The soil where I live stays warm well into December. That’s why fall is a good time to plant trees. There will be a good 4-6 weeks before the ground hardens and the winter cold pushes plants into dormancy. Plants that have been established in pots over the growing season have strong enough roots to get them into the ground now so they can settle in before the winter soil freeze. I would be less enthusiastic if these plants were recently planted and their roots were still developing. When you see roots waving at you from the bottom of the pot that’s a sure sign the roots have had a good growing spurt. If you have bare root plants, I would pot them in new potting soil, water them well and bury them in a garden area still in their pots. A nice mulch blanket of dry leaves will keep moisture in the soil and protect the plants from temperature fluctuations. I also place a couple of handfuls of wet dry leaves in the bottom of the hole to make sure the roots have access to moisture. I will do the same thing with any plants I can’t get into the ground now. I have successfully pulled a number of plants through winter still in their pots in my nursery area but I do feel guilty when they are still growing there after 2 years. I really should move them into their final growing space in my garden. Cut peonies out of my garden in my kitchen going on two weeks now. Sorry you are having trouble enjoying cut peonies inside, peonies are one of the many garden flowers that make wonderful cut flowers, it is one of the reasons why I love having them in my garden. Besides the beauty of the flowers and watching ants on the buds, cut peonies have a lovely fragrance that infuses any room. I like to add bouquets to bathrooms and, obviously, my kitchen. 1. Cut the peony flowers when the buds are starting to unfurl, not when the flowers are in full bloom. Make sure to shake off the ants before bringing them inside. 2. 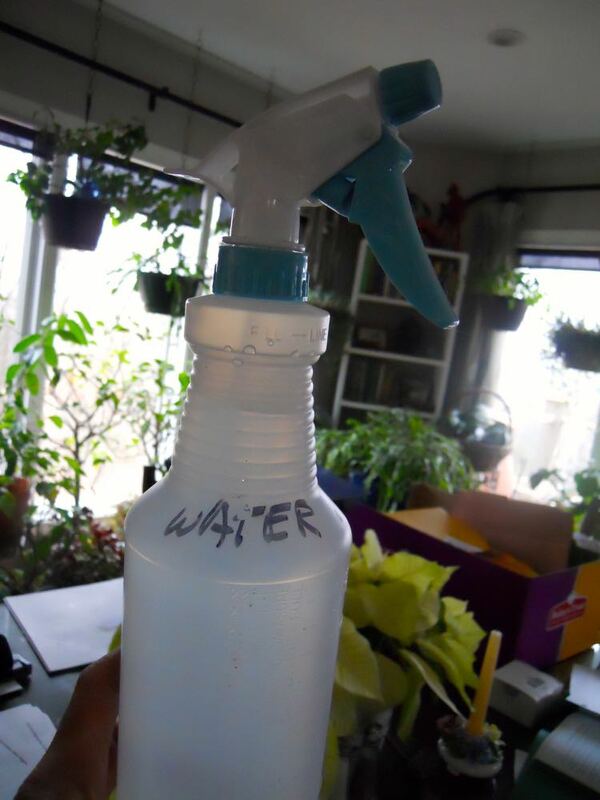 Use tap water you've let sit for at least a day to eliminate fluoride or rain water in the vase. 3. Trim the flower stems every day or every other day and give them new water. 4. Place the flower vase away from heating and air conditioning vents. Don't place your vase on top of a hot TV, next to a stove or anything that radiates heat. 5. Keep furry paws away from the flowers. I do battle with one of my cats that likes to bop the peony buds like tiny boxing bags. Let me know how these work for you. Peonies are well worth the effort! 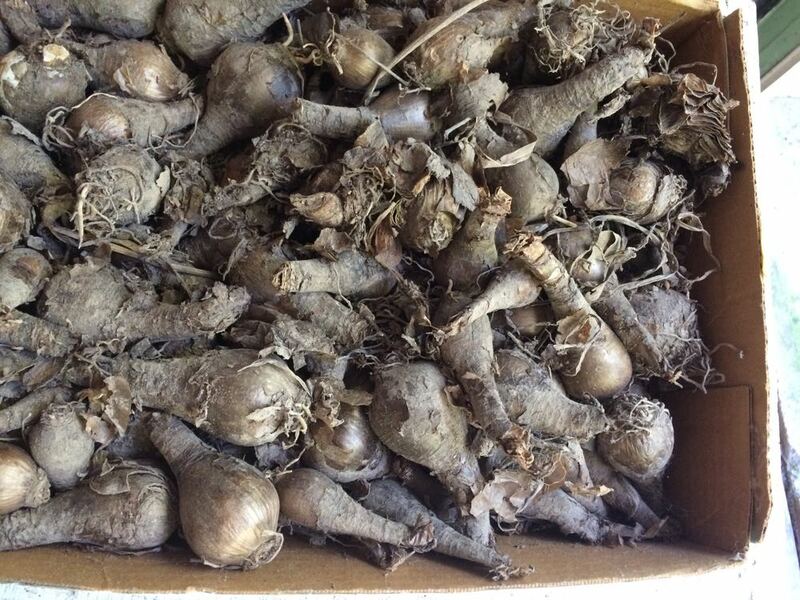 Dried surprise lily bulbs ready to be planted, they look similar to daffodil bulbs. That's exciting, means the bulbs are settling in well, that's not a garden surprise, is it? No, if you added bulb fertilizer in the bottom of the holes before planting that should be enough. 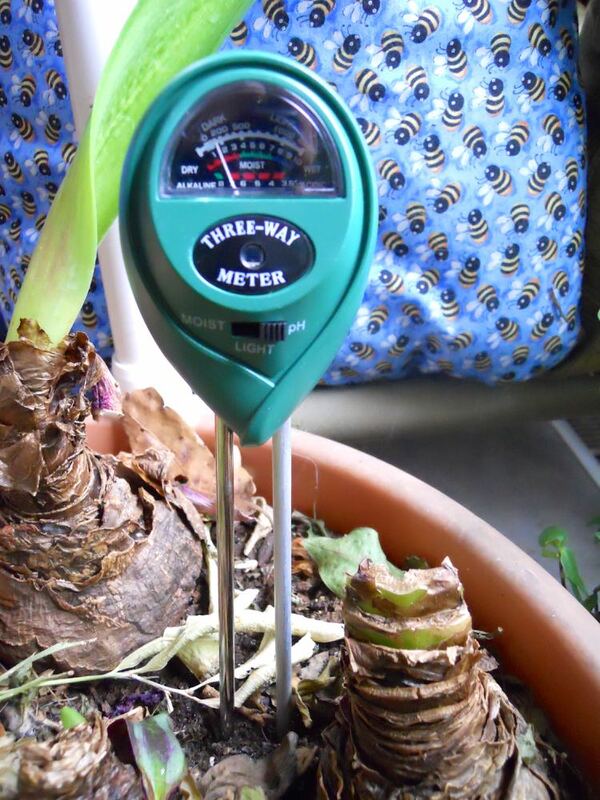 Leave the bulbs alone until you start seeing little buds on stalks popping up. 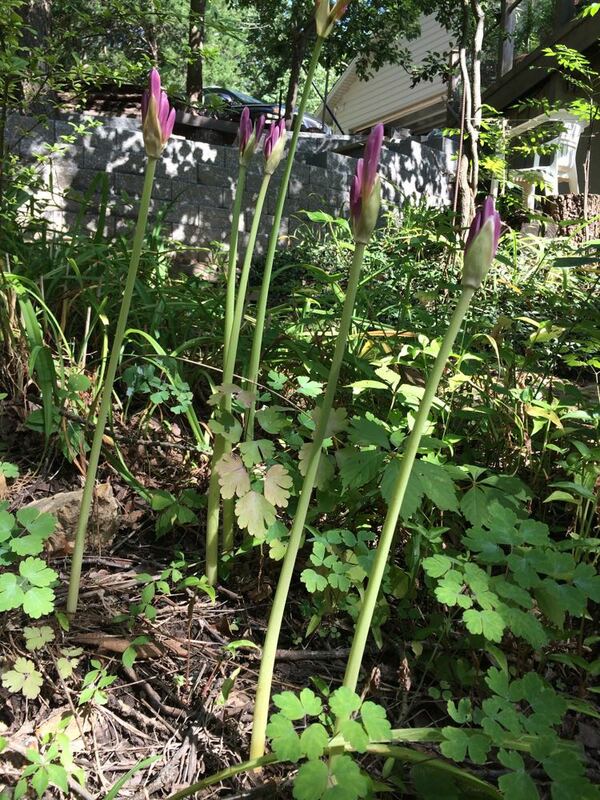 Surprise lily buds start growing mid-July in my Missouri hillside garden. Once the greenery is up, let it go through its full cycle and turn yellow, don't cut it or remove the greenery, that's how the bulbs build up their energy. I plant surprise lilies in flower beds where other flowers help to cover them as they die down. I tend to plant mine with other plants around them so they cover up the greenery as it dies back. 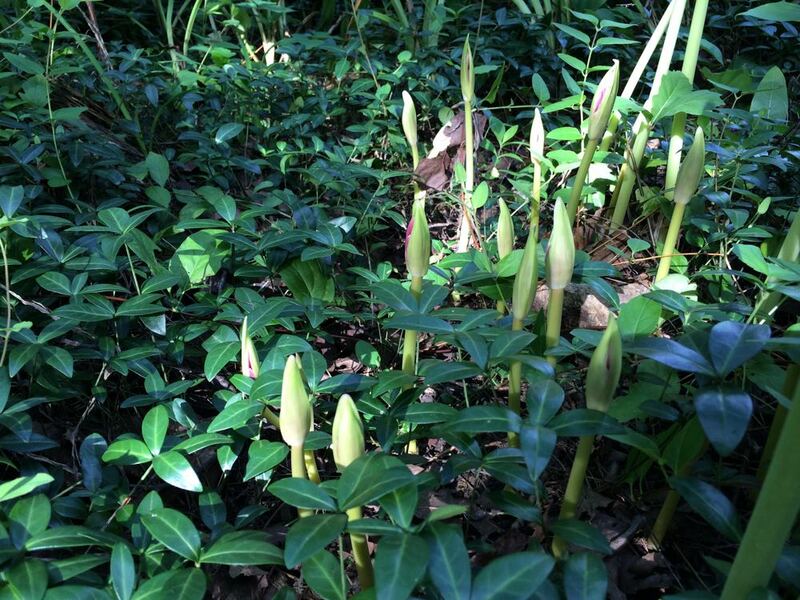 We should have a good year for surprise lilies, the cold temperatures will trigger the growth. The cold temperatures winter 2017-2018 will set the bulbs to blooming later this year. 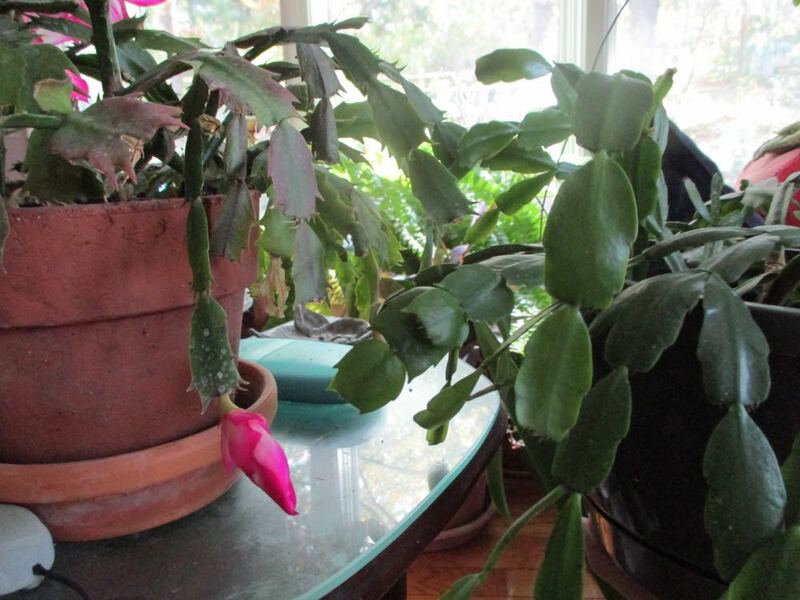 The cactus on the left is a Thanksgiving cactus, the one on the right a Christmas cactus. Hi Martha, I also have a “Christmas” cactus blooming right now, I’m embracing the blooms and calling it my Winter cactus. These hardy tropical plants need a little help to bloom on cue here in Missouri. Back in their native Brazil ,they have weather triggers to get them to bloom in December, the beginning of the South American summer. Your cactus may be the older, true Christmas cactus if it came from your grandmother. Most cactuses sold on the market today are actually Thanksgiving cacti, which explains why they tend to bloom end of November. To determine what kind of cactus you have, look at the green fronds. The original Christmas cactuses (Schlumbergera bridgesii) have smooth, round edges while Thanksgiving cacti (Schlumbergera truncata) have pointy, jagged ones. Mine started to bloom because I had it outside on my back porch last fall. Thanksgiving and Christmas cacti are called "short day plants" meaning in order to produce flower buds, they require fewer daylight hours and/or cool night temperatures. Our fall shorter days and cooler nights signal the plants to produce buds. 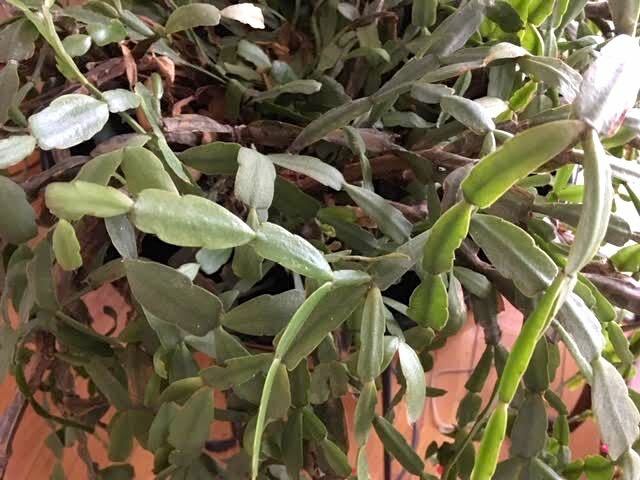 To get your Christmas cactus to bloom when you want the blooms, locate it indoors in a cool, bright location where daytime temperatures are 65-70° F and evening temperatures are 55-65° F. If plants are exposed to cooler night temperatures of 55° F, plants will bloom in approximately 5-6 weeks, sometimes regardless of the day length. My Thanksgiving cactus in bloom, see the spiky ends to the green fronds? I frankly don’t mind when they bloom out of season, I love having them in bloom any time they decide the time is right. Maybe you can also leave Santa Claus a note? 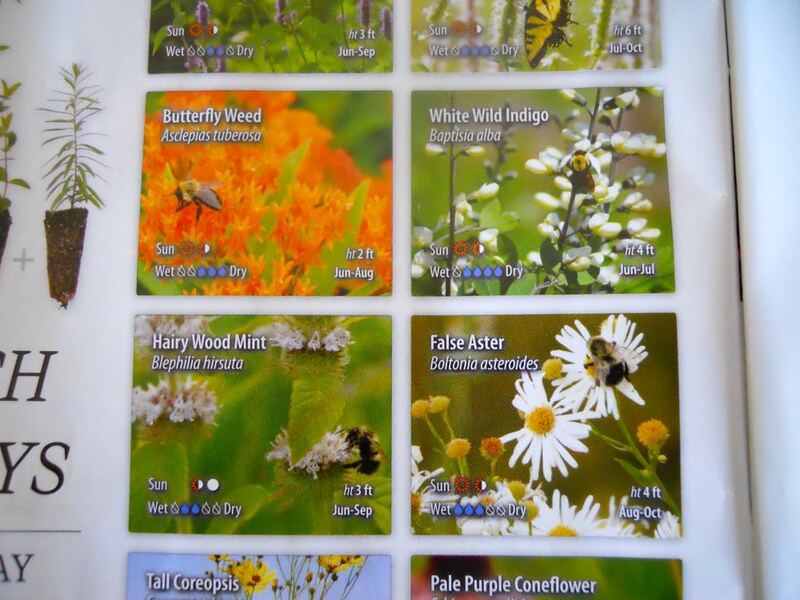 Prairie Moon Nursery's catalog has plants and seeds easily identified as pollinator plants. Glad you enjoy my writing. That's a very good question because many wildflowers do need special care before they will grow, something some people don't realize when they pick up wildflower seeds. Stratification is exposing seeds to the same conditions they would have in nature to break their dormancy, something akin to kissing Sleeping Beauty to get her to wake up. Some seeds require moisture and warmth, others exposure to cold for a period of time, and even others such as pine tree seeds need exposure to heat and fire. Many seeds sold today don't tell you whether they have been pre-conditioned or not so if you're not sure, it's best to treat the seeds. My favorite native plant catalog just arrived marked "damaged by the Postal Service" so my apologies for the rough look, I didn't do it, I promise! I posted this so you could see USPS damage stamp but my, my those free seeds are distracting. 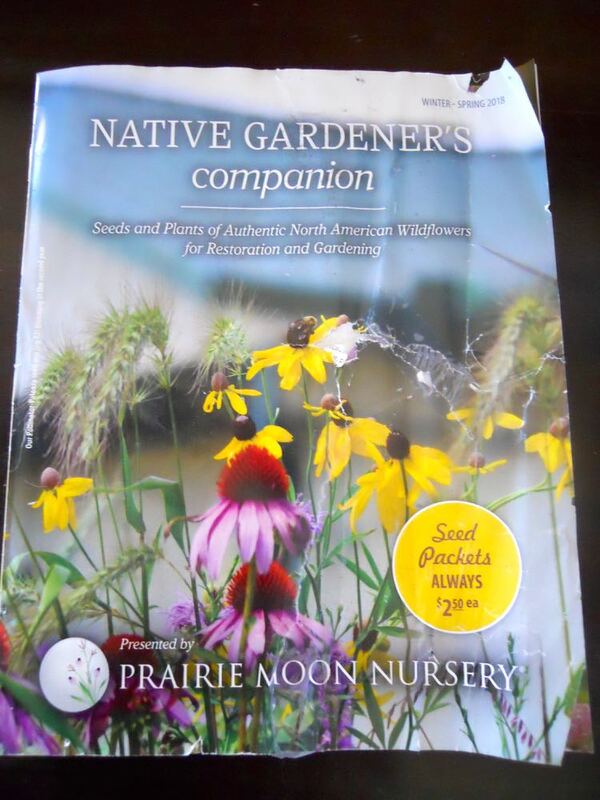 Prairie Moon Nursery's native North American Wildflowers plant catalog with handy guides. My favorite native plant catalog with how to guides is the Native Gardener's companion out of Winona, Minnesota is Prairie Moon Nursery's Native Gardener's Companion, Seeds and Plants of authentic North American Wildflowers for Restoration and Gardening. Whew, long title but it gives you an excellent idea of what you will find inside. Not only do they have lovely photographs of wildflowers, a must for any reference catalog, but they have added "how to" guides including a very helpful guide to stratification. They call it "germination codes and instructions," a handy guide to how to unlock those seeds and how long they need to be exposed to specific conditions. 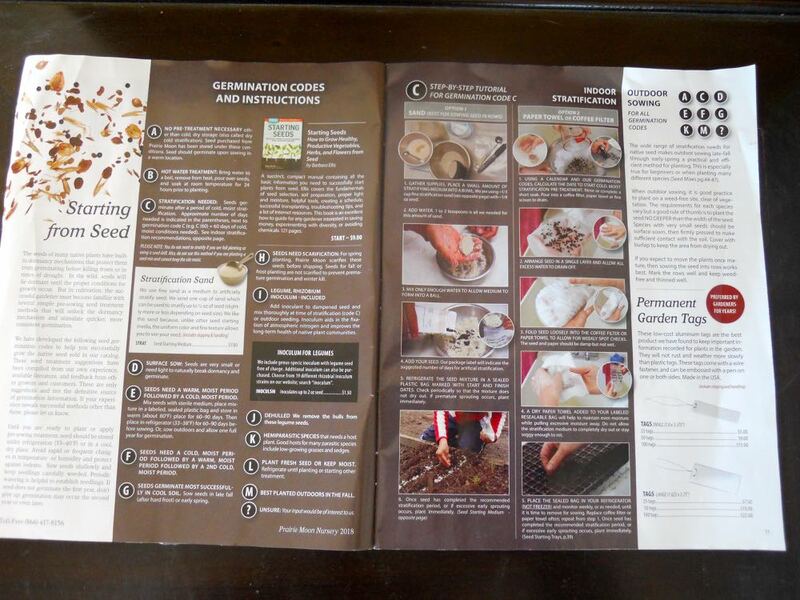 Prairie Moon Nursery catalog guide to germination has photos to illustrate the information. Not sure what to plant together? 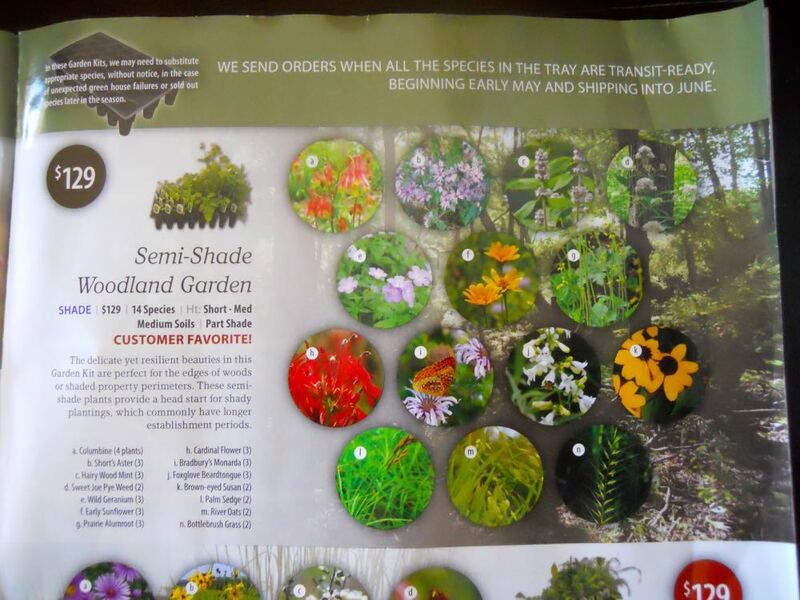 This catalog has suggested planting combinations, which always gives me some good ideas for where to add plants to ones I already have started, or how to combine the ones I may find on sale. Since I tend to be a frugal shopper, these combinations are great inspiration because I don't always buy the plants that end up together at the same time. Or my friends don't share their surplus plants when I get other ones. This is also another good source for plants if you don't want to wait, they are locally-grown, not wild-dug, and at least 1-2 years old, which is unusual any more. That means these are established plants and have a better chance of successfully transplanting. Some of the wonderful plant combinations, and color combination inspiration. Back to those tempting seed packets. The seed packets are $2.50 each which is a less expensive way to try new native plants to see if you can grow them, and if they take in your growing conditions. This last seed mix name had me chuckling, we all want seeds to quickly start, don't we? 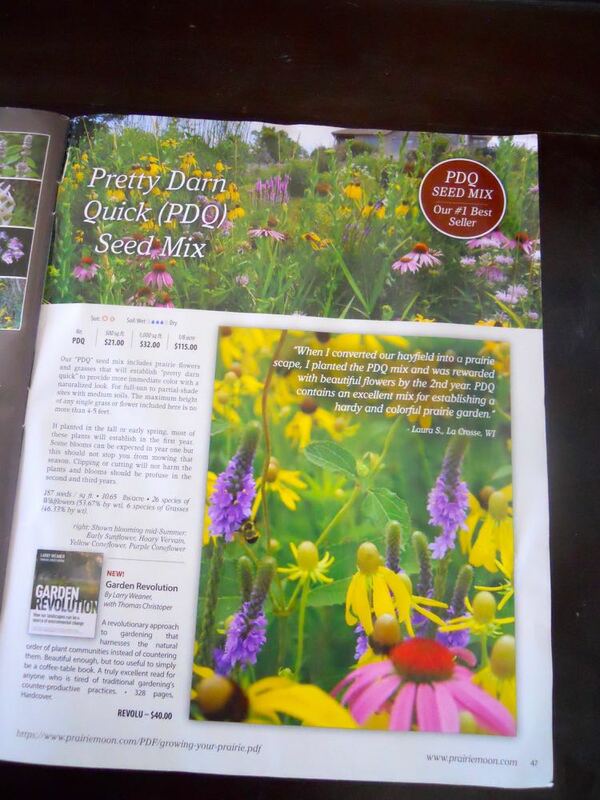 Prairie Moon Nursery native plant catalog features quick seed mixes for pollinators. Not sure what plants attract what pollinators? Let's all turn to page 35-36, they have a wonderful guide on what kinds of plants attract what pollinators. And to those of you new to this, if you find your brand new plants munched on, congratulations, that means some bug found the food source you planted for them. This Plant-Insect Interaction guide provides a cheat sheet for what to plant for what pollinators. Their plant photos actually feature some of the pollinators that are attracted to the wildflowers. I now am at a point in my garden photography that if I don't see a pollinator on a plant, the photo is not complete, every plant with a pollinator on it is a story. Aren't these just marvelous?? Love, LOVE these plants photos with visiting pollinators, this is the way flower photos should be! One more note, Prairie Moon Nursery has this native plants catalog and a more detailed cultural planting guide for advance gardeners and professional landscapers. You can also download both catalogs online if you don't want to wait for a catalog to be mailed to you. If you live close to where they are located, make sure to call first, tours of the nursery are only available through appointment. Sigh. I sure do like seeds. So this year, every Prairie Moon Nursery order includes a free packet of Wild Bergamot (Monarda fistulosa), I have bergamot growing all over my one-acre certified wildlife and Monarch Way Station hillside garden but I would gladly add more! Let me know what you think of the Prairie Moon Nursery catalogs, and if you try out any seed packets! Marigolds growing in my old vegetable garden. Hi Ardith, from what I have read marigolds have been hybridized to the point where they are not as effective as they used to be to deter bugs. I used to plant them every year to not only deter bugs but to provide long-lasting cut flowers. I now use annual basil to line my garden beds and include pots of basil between other potted plants to deter insects. One of the best sources for heirloom seeds is Baker Creek in Mansfield, Missouri. The seed company started to preserve heirloom and old-fashioned seeds and has quickly become a major provider of the kinds of seeds you are trying to find. Stick with the old-fashioned varieties like tiny French marigold. The white ones were introduced a couple of decades ago and have almost no scent. They are pretty to have in the garden but don't do much to deter bugs. These yellow irises were a gift from a friend’s garden. She dug them up after they had bloomed so once in my garden, they bloomed the following year. When dug up while blooming, it can take iris 2 years to bloom again. The best time to divide irises is immediately after they bloom through fall. No need to dig them up now and store unless you are moving, best to keep them in the ground growing until you are ready to divide and replant. Decreased blooming is a definite sign your iris are ready to be divided. The next sign that you should consider transplanting your iris is if the roots, or rhizomes start heaving out of the ground. Overcrowded iris rhizomes will start to push on each other, which results in the entire root system of your iris plants literally pushing themselves out of the ground. They may even stop putting up foliage and the plants may only grow foliage on the outside edges of the clump. The best time to transplant iris is in the summer, after the iris have finished blooming, up until fall. To divide your iris, start by lifting the clump of iris plants out of the ground with a spade or fork. If possible, lift the whole mass out whole, but if you are unable to do this, carefully break the clump into smaller parts and lift these out. Next, brush of as much dirt as possible from the iris rhizomes. This will make it easier to see when you are breaking the clumps apart. The next step in dividing iris plants is to divide the iris rhizomes. Irises store energy in their rhizome, or root. To divide these roots, make sure a piece of green foliage is attached. Cut the foliage back 4-6 inches after blooming and move to their new location. Also plant the root very shallow in the ground, barely covering the tiny roots on the side of the rhizomes, and water. Each iris rhizome should be divided into pieces that are 3 to 4 inches long and have at least one fan of leaves on the rhizome. Do not remove the roots from the rhizomes. As you get closer to the center of the clump, you may find large sections of rhizomes that have no leaf fans. These can be composted. Check all of the divided iris rhizomes for iris borers and disease. The iris rhizomes should be firm and not soft. If the rhizome feels soft, throw it away. Once the iris rhizomes have been divided, you can replant them. First, trim all of the iris leaf fans back to about 6 to 9 inches tall. This will allow the plant to re-establish its roots without having to support a large amount of foliage at the same time. Next, plant the iris rhizomes in the selected location. This location should receive a good deal of sunlight and should be well draining. Dig a hole where the rhizome will settle into the ground just below the ground level. If planting several iris near each other, point the rhizomes away from each other and space them 18 inches apart. Spread the roots out around the rhizome and then cover the roots and the rhizome with dirt. Water the newly transplanted iris plants well. The telltale signs of moles include raised soil as they tunnel a good 10 inches underground along flower beds and maybe even through your lawn. There are six species of moles living in North America. It may seem like all of them are working your yard at once but the one that makes all of those runs is the Eastern Mole. These pointed-nose insectivores tunnel year around looking for earthworms, grubs and other insects. If you have a lot of moles, you probably have an oversupply of grubs and bugs. Try spraying your lawns with milky spore disease or beneficial nematodes to get rid of the grubs. This will also rid your lawn of Japanese beetle larvae but it may take a year or two to start seeing results. Try sprinkling powdered red pepper at their tunnel entrances and coffee grounds where tunnels are starting. Mix up a spray of 3 parts castor oil to 1 part dish detergent; use 4 tablespoons of this concoction in a gallon of water, and soak the tunnels and the entrances. ·Another mole repellent is 6 oz. of castor oil and 2 tbsp of Murphy’s Oil Soap or dish soap in one gallon of water to make a concentrate. Mix one ounce of concentrate per gallon of water and apply to the lawn. Make sure to reapply the homemade mole repellent after rain or watering. If moles are in a garden area, dig a trench roughly 6 inches wide and two feet deep. Fill it with rock or line it with wire to prevent burrowing pests from invading. The most effective and reliable method for controlling moles is to trap them. Traps should be placed in early spring when you first notice tunnels, or after the first fall rains. Determine which tunnels are active by flattening the run, marking the location, and checking to see if the tunnel is raised within a day or two. Traps work well because they capitalize on the mole’s natural instinct to clear an obstructed tunnel. Use a humane trap, and release the moles at least 5 miles from your home in a rural area away from someone else’s garden. If you want to protect specific plants, dig a 2- to 3-foot hole and line the sides and bottom of the hole with wire mesh. Fill the hole with soil and plant. Don’t bother with home remedies such as chewing gum, mothballs, broken bottles, flooding and laxatives – studies have shown that these substances are ignored. Castor bean plants are an interesting annual but there is little proof they actually deter moles in a garden. One of the more traditional mole deterrents is planting castor beans. Although very dramatic, and Thomas Jefferson once grew a specimen to 22 feet, there is no proof that these plants deter moles so plant only if you want something exotic growing. Trying to rid your garden of moles can be frustrating so look at it another way. If you have Japanese beetles, moles can be your friend since they eat Japanese beetle grubs that become those little green eating machines. Moles will eat as much as 70-80% of its body weight in insects every day. In addition, moles help aerate soil, something that in the Ozarks one usually has to use a pick ax to do. My favorite, and the gardening gloves I recommend, with re-inforced fingertips. Kenny, finding the right gardening gloves can be a challenge because there are too many choices. When I have only the wrong gloves available. I won't use them and that's SO bad for my hands. It takes weeks for the damage to be repaired, and in the meantime I live with painfully cut and scratched hands with broken nails....not a pretty sight. When I have good gardening gloves that fit well and stand up to my gardening habits, I can spend most of the day in them and still get a lot done. I have tried a lot of gloves and carry these gardening gloves because they have lasted the longest and survived me, no small feat. Thanks for sharing, nice to hear I was able to help! Hi Nadine, there are several ways you can tell if your mum starts now have roots. One way is to observe how the cutting is doing once you placed it in the ground. In the photo, I have two mum cuttings. If I had to guess at this point, the one on the left has a better chance of rooting than the one on the right. The leaves and flowers on the one on the left are still green and vibrant; the cutting on the right is shriveling, which means no water and nutrients are getting into the plant. One thing you could do about the one on the right is gently remove it out of the ground, re-cut the end to right under a growing node; re-apply root hormone and stick it back in the ground. The second way is to gently tug on the root cutting. If the plant resists, chances are roots are developing. If the cutting comes up, recut the bottom, re-apply root hormone and try again. The last way is the surefire way. If you are transplanting the cuttings to a permanent spot, you can peek at the bottom to confirm roots as you are transplanting. Here's another batch of mum starts in my garden. Which ones from this photo do you think are getting a good start so far? If you don't have root hormone - I tend to run out at the end of the season - you can also root mum cuttings in water. I use a clear glass so that I can easily see when the roots get started. Replace the water daily and keep them away from curious cats, one of mine likes to re-decorate the house with mum cuttings. Not must mum cuttings, anything in water is an invitation to drag the greenery all over but that's another story. Also remember to water seedlings once a month through winter so you will have established perennials. Good luck!